The 88th edition of the Japanese National Boxing Championships was held in the city of Ibaraki and the five-day long competition delivered several world class level contests. Japan’s middleweight (75kg) boxer Yuito Moriwaki was the MVP of the event but Tosho Kashiwasaki, Arashi Morisaka, Daisuke Narimatsu also won their weight classes following the strong surprises. The men’s elite boxers could attend altogether in eight weight classes in Ibaraki where the average age of the athletes was one of the youngest ones in comparison to the other Asian countries. The Japanese National Championships was held from the light flyweight (49kg) up to light heavyweight (81kg). The first gold medal of the Japanese National Boxing Championships was achieved by FISU University World Boxing Championships silver medallist 21-year-old Yudai Shigeoka who had a closer semi-final against Asato Kataoka but following that success he was too strong for Daichi Hasebe. Besides to Kataoka the second bronze medal was taken by another young prospect Ryusei Matsumoto who attended in the international events in 2018. Tosho Kashiwasaki has got strong experiences in the international stage, he is member of the national team since 2012. The flyweight (52kg) hope defeated Rio 2015 Olympic Test Event winner Ryomei Tanaka in the final of the National Championships. National team member Tomoya Tsuboi achieved only bronze medal in Ibaraki. 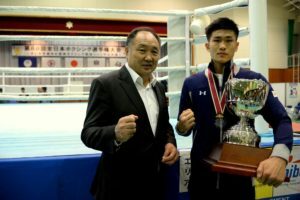 ASBC Asian Youth Champion Ryutaro Nakagaki and Hamburg 2017 AIBA World Boxing Championships competitor Ryusei Baba both failed to get any medal in the Japanese National Championships. Japan’s top future star in elite boxing could be AIBA Youth World Champion and two-times ASBC Asian Youth Champion Hayato Tsutsumi but the 19-year-old boxer suffered a hand injury after the quarter-finals and he was unable to box in the semi-finals. Following his absence in the event Nanjing 2014 Youth Olympic Games bronze medallist Subaru Murata took the title of the bantamweight (56kg) following his triumph over Keisuke Matsumoto. Rio 2016 Olympian Arashi Morisaka is Japan’s best lightweight (60kg) boxer who had to do his very best to beat his main national rival ASBC Asian Confederation Boxing Championships bronze medallist Kenji Fujita in the final. Experienced but young hopes such as Asian Games Test Event silver medallist Rentaro Kimura and Taiga Imanaga claimed only bronze medals in Ibaraki. Another Rio 2016 Olympian boxer Daisuke Narimatsu is the most experienced in their national squad who claimed bronze at the Jakarta 2018 Asian Games as well. The 29-year-old light welterweight (64kg) boxer repeated his 2017 performance in the national level and defeated Yuta Akiyama in the final. Seon Okazawa’s father arrived to Japan from Ghana and his son reached his career highlight in Ibaraki. He moved up to the welterweight (69kg) and used better tactic in the final against Hiroaki Kinjo than in the last Japanese National Sports Festival and has done revenge. Japan’s Jakarta 2018 Asian Games competitor at the welterweight (69kg) 19-year-old Issei Aramoto lost to Okazawa at the quarter-final which was another surprise in Ibaraki. Asian Games Test Event winner Yuito Moriwaki is only 22 and joined to the national team one year ago but he was named as the MVP of the Japanese National Championships in Ibaraki. He stopped Rikiya Horiguchi and Yuya Tanaka winning those contests by RSC during his road to the final where he dominated his fight also against Kyohei Hosono in the title bout. A 21-year-old promising boxer Ren Umemura did not get any medal this time at the middleweight (75kg). Six elite male boxers attended at the light heavyweight (81kg) which category was re-activated in Japan. Takuro Kurita took silver medal in the 2016 edition in Ehime and after two years his skills were enough to get the title in Japan. Kurita eliminated Masaki Yamada in the semi-final and he was better than Ryuto Nitta for the last title.